Starring Hugh Bonneville, Sally Hawkins, Julie Walters, Madeleine Harris, Samuel Joslin, Hugh Grant, Brendan Gleeson, Jim Broadbent, Simon Farnaby, Peter Capaldi, Joanna Lumley, Sanjeev Bhaskar, Tom Conti, Noah Taylor, Eileen Atkins and the voices of Ben Whishaw, Michael Gambon and Imelda Staunton. Screenplay by Paul King and Simon Farnaby. Distributed by Studiocanal. 103 minutes. Rated PG-13. Many of us grew up with Paddington as children – the trench coat and floppy-hat-wearing, orange marmalade eating, talking bear from the deepest, darkest, Peru. The books were endearing and the first Paddington movie (2014) was charming, well-acted, silly, and fun. 2018 brings us the second installment of the series with the ever-kind, polite, and charming Paddington Bear and his adoptive family, the Browns. Mrs. Mary Brown (played by Sally Hawkins) is busy training for a cross-channel swim from London to France. Mr. Henry Brown (played by Hugh Bonneville) is having a bit of a midlife crisis after being overpassed for a promotion at work. Judy (played by Madeleine Harris) is suffering from a broken heart. Instead of wallowing, has created her own newspaper with no boys allowed on staff. Jonathan (played by Samuel Joslin), in his own mini exploration of coolness, has closeted his love of steam trains and changed his name (not permanently, thank goodness) to J-Dog. And Paddington (voiced by Ben Whishaw) has established himself as a vital member of the neighborhood where his intricate and funny routine leads him through his daily interactions with his neighbors. 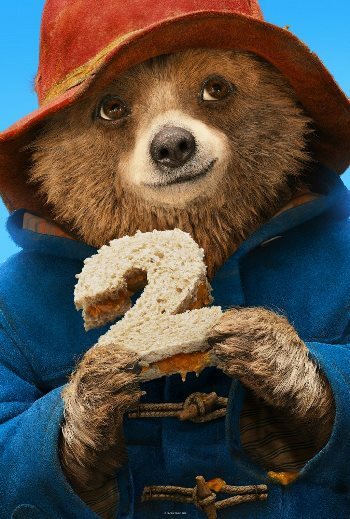 The sequel starts with a lovely origin story of how Paddington found his place with his “Aunt” Lucy (voiced by Imelda Staunton) and “Uncle” Pastuzo (voiced by Michael Gambon). Both of them are on the verge of their planned journey to London which is halted when they take in the little cub – giving background to Aunt Lucy’s lifelong dream of going to London. The animation is beautiful and believable, while the story is a little more thrilling than I would have anticipated for a family movie. Not to say it is scary, but I was drawn to the edge of my seat from the beginning. Paddington 2’s plot begins to develop at Mr. Gruber’s Antique Shop, where Mr. Gruber (played by Jim Broadbent), shop owner and friend of Paddington, is always on the lookout for the perfect hundredth birthday present for Aunt Lucy. He shows Paddington a couple of antiques from the collection of mysterious Madame Kozlova, including a rare pop-up book of London. As Paddington flips through the pages, the viewer is treated to stunning animation – combining the 3D computer generated Paddington with the 2D paper cut out effect as he journeys from page to page. Paddington is excited about how this will bring London to his Aunt Lucy, as she was never able to travel there herself after the canceled trip years earlier. Though he is faced with the high cost of such a rare book, Paddington does not waiver, and instead takes on a few odd jobs, some successful, and one hilariously not. Hugh Grant steps in to the villain role as Phoenix Buchanan, a narcissistic, beyond-his-prime actor, neglected by his agent. Buchanan is mostly remembered for his role as a dog in a commercial, and his dwindling career has left him eating dog food. When Phoenix discovers that Paddington is working to raise funds to purchase the pop-up book, he realizes that it is the book of his family’s lore. It will lead him to Madame Kozlova’s treasure, so he hatches a plan of thievery that somehow leaves Paddington behind bars. For the record, this was my biggest complaint of the movie… I can buy into the talking bears and breaches of common physics, but how do you sentence a character to jail without evidence? So, Paddington finds himself incarcerated, but maintaining his ever-hopeful spirit and ability to see the good in everyone, including the gruff and formidable prison cook, Knuckles McGinty (played by the fabulous Brendan Gleeson). But remember, this is a family movie, so prison never gets too gritty. In fact, turns a bit rosy after a laundry incident. The plot weaves and winds through an entertaining story, with good family messages of kindness, friendship, and hope. Still, it remains complex enough to hold a grown-up’s attention. It is smart and silly, with merely one or two cringe-worthy jokes, which is saying a lot in today’s family movie genre. I am happy to report that Paddington 2 continues the series’ charming streak. I am hopeful that they will move on with plans for a Paddington 3. My teen hopes they quit while they are ahead. Tags: Ben Whishaw, Bonnie Paul, books, brendan gleeson, children, Eileen Atkins, hugh bonneville, Hugh Grant, Imelda Staunton, Jim Broadbent, Joanna Lumley, Julie Walters, Leni Paul, Madeleine Harris, Michael Gambon, movie review, Noah Taylor, Paddington, Paddington 2, Peter Capaldi, PopEntertainment.com, sally hawkins, Samuel Joslin, Sanjeev Bhaskar, Simon Farnaby, Tom Conti. Bookmark the permalink.